วิมานเสม็ดรีสอร์ท รีสอร์ท สไตล์บ้านทรงไทย ท่ามกลางท้องทะเลอันสวยงาม หาดทรายขาว บรรยากาศร่มรื่น ด้วยการตกแต่งที่ลงตัวของรูปแบบรีสอร์ทสไตล์บ้านทรงไทยอยุธยาและบ้านสไตล์ไทยประยุกต์กับท้องทะเลแห่งเกาะเสม็ดทำให้คุณได้รับความรู้สึกที่อบอุ่นและกลิ่นไอ้ทะเลอันสวยงามห้องพักติดริมทะเลทุกหลังให้บรรยากาศพักริมทะเลจริงๆ เหมาะกับการมาพักผ่อนเป็นคู่หรือเป็นหมู่คณะก็ดี เรายินต้อนรับท่านสู่...วิมานเสม็ด. 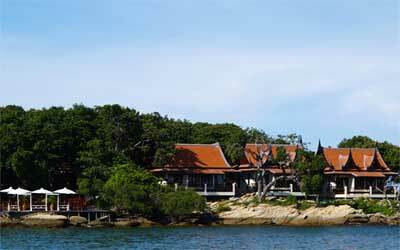 Vimarn Samed Resort: Outstanding for its Thai architectural bungalows in Ayutthaya traditional style, Vimarn Samed Resort is one of the best resort located at Vongduern bay. We offers 6 choices of accommodation, close to the crystal clear ocean. All bungalow are fully equipped & focusing on the privacy of the guests, those are suitable either for lovers or families. Besides the comfortable room, with a few steps you will reach the sandy beach, favourite water activities such as banana boat or donut (if you never see thing like this, you must come for once in the life!). Here at Vongduern beach, you can find all necessary things by local agency who can provide you the boat trips (sightseeing around the island, fishing trips or snorkelling to exploring the nearby islands), bus/van trips (to anywhere in Thailand start from Ban Phe) or tickets service. Many bars & restaurants can also be found here, to serve you the fresh sea food or even the good wines.. to make sure that your night will be completely beautiful. One who has been here is likely to return for one more time !